Posted on Tue, Nov 15, 2011 : 5:52 a.m.
University of Michigan Athletic Director Dave Brandon Monday outlined something all college sports fans know but top college officials rarely say: "The cost to compete at the national level is high." 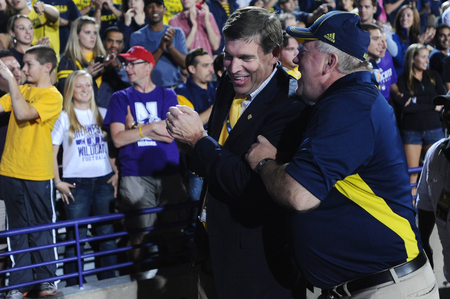 Michigan athletic director Dave Brandon smiles as he leaves the field with the team after beating Northwestern University. Brandon made the remark during a talk he gave at the Stephen M. Ross School of Business on Monday night. The speech focused on sports and their effect on the economy. Brandon is running the third largest athletic department in the nation: U-M's budget is $109.8 million. In two years, the department's budget has grown by nearly 30 percent, from $84.6 million in 2010. 2011 was the first year in U-M history that athletic department spending topped $100 million. Part of that expense is due to a targeted marketing campaign. Brandon's talk comes in the midst of a 8-2 season for the Wolverines. It also prefaces the 2012 season, which U-M is opening against powerhouse University of Alabama at Cowboys Stadium in Dallas for a payment of $4.7 million. Brandon told the crowd of more than 300 students that the athletic department —which employs 275 full time staff and hundreds of seasonal staff— derives two-thirds of its revenue from the football program. Only three U-M sports —football, basketball and hockey— generate revenue. Hockey, however, generates minimal revenue, leaving football and basketball to support 26 other Wolverine sports teams. "The men's hockey program is very marginally positive... at least it pays for itself and in a good year generates a few extra dollars," Brandon said. "Football and men's basketball support virtually every college athletic program in the country." At U-M, that includes' 29 teams travel, meal, equipment and facility costs. Scholarships are costly too. The department this year funneled $17 million to student athletes. "We're chartering airplanes, we're flying to locations all over the country to get our student athletes in and competing," Brandon said. Football, Brandon said, represents two-thirds of the athletic department's revenue, which he expects to be about $125 million this year. Brandon said that football also accounts for a large part of fall revenue for Ann Arbor businesses. He said that a home football game at the Big House generates $15 million in business for area hotels, restaurants and merchants. "If you think of Michigan athletics as an economic engine, it's pretty big, it's pretty widespread," he said. "This college football program that we offer has a huge impact on the economy of this state." "You have no idea how many private jets land at Willow Run Airport (on game days)," he continued. This season, attendance at football games topped record levels and all premium seating —including the 81 luxury boxes added after the Big House renovation— is sold out. And with ticket prices increasing by 21 percent this season —student season tickets rose from $197 in 2010 to $240 but included an extra game— Brandon's department is enjoying a lucrative period. In 2010, Michigan was one of only 22 NCAA FBS athletic departments to subsidize itself completely. The average FBS athletic department is in the red by $11.3 million, a gap that is usually covered by general fund dollars. Brandon said the athletic department has about $200 million in debt, largely due to large renovations, such as the Crisler Arena and Big House upgrades. "When we recruit student athletes at Michigan, they’re very focused on the competitiveness of the facilities that we offer," he said. "We will continue to invest substantial millions of dollars.. to feed our athletic department and keep it successful." With the university brand reliant on its sports program —and much of Ann Arbor's economic vitality too— Brandon says the athletic department and its athletes face a lot of pressure. "The pressure to win is great because I am here to tell you people don’t show up if their team is losing," Brandon said. "If you're winning, you get put on the big stage (nationally)... if you win, donors donate more money —funny how that works." Wed, Jan 18, 2012 : 11:51 a.m.
Thu, Nov 17, 2011 : 1:48 a.m. Wed, Nov 16, 2011 : 12:02 p.m. Wed, Nov 16, 2011 : 2:35 p.m. There's a seating capacity of 109,901 (I believe the total attendance takes into account everybody including the band members, people working concessions, etc.) 25,000 seats for the students, probably 5,000-10,000 for visiting fans, maybe more or less depending on the quality of the visiting team., leaving you about 75,000 people. I'm guessing a quarter of those are kids high school or younger, leaving you 60,000. I'm guessing half are alumni, so 30,000, but your guess is as good as mine. So with the kids, and an estimated 30,000 non-alumni, I'd say 45,000 non-alumni fans, or about 41%, 9% visiting fans, give or take, with about 50% being current students or alumni. I'm assuming you're not a Michigan fan, throwing around the deragatory term &quot;Walmart Wolverine.&quot; If you have read the &quot;The Big House: Fielding H. Yost and the Building of Michigan Stadium,&quot; you'd know that Yost envisioned a stadium built to seat the general public along with the Michigan students and alumni, which is why he continuously pushed for more seats and had supports built to support as many as 150,000 fans. Wed, Nov 16, 2011 : 12:12 p.m. I understand your point. Michigan alums are spread out across the nation and globe. It would seem that the out-stae alums come back as often as they can. As for the &quot;Walmart Wolverine&quot;, to me, all are welcome. It sounds like we did not lose too many of them the previous three years under, you know who. Wed, Nov 16, 2011 : 2:39 a.m.
&quot;You have no idea how many private jets land at Willow Run Airport (on game days),&quot; he continued. Is this a veiled slam against Ann Arbor Airport? Don't tell me that U of M has joined the anti-airport crowd. Numerous private planes (piston, turboprop, and jet) fly into Ann Arbor Airport on game days as it is much closer and more convenient than Willow Run. It is a vital gateway into the city and a huge asset to the community. Fri, Nov 18, 2011 : 1:28 a.m. But there are severe limits on the size and number of planes that can land at Ann Arbor Airport and Willow Run isn[t that far away. Wed, Nov 16, 2011 : 2:09 a.m. Wed, Nov 16, 2011 : 4:16 a.m.
What a shame? Big time college athletes get a FREE education, are trained by the best in the business, compete in world class facilities, and the select few have opportunities to make MILLIONS of dollars at the next level. Guess what, football revenues pay for all of it. The prevailing lie out there is that college football and basketball players are suffering in some way. Like free tuition, books, room and board is not enough? You have to include the travel per diems (I know for a fact that in the early 2000's U of M cros county runners recieved $100 per day for trips. Do the math!!) Oh yeah, I forgot all college kids need Escalades. You know, to go home and visit mom. Agents are trying to get a cut of the college buck. Plain and simple. Wed, Nov 16, 2011 : 1:15 a.m.
Tue, Nov 15, 2011 : 10:29 p.m. Success breads success but there is a line that must not be crossed: win at all costs. What jumps at me is that all 81 suites have been sold. Remember one year ago when the number was somewhere in the 50s? I do not know the real number but after Rich Rod's third year and first year of the renovated Big House, suite sale were off to a slow start. The economy is still very sluggish so we can't use that excuse. The Brady Hoke era is off to a great start. Michigan is under the gun to keep winning in the following seasons. That's why it boggles my mind that Mr Brandon added App State in 2014 and U-Mass in 2013. I would think that we'd have the pick of litter, any big team from any conference for a home and home. If the U-M basketball program can build on their 2010-11 momentum, then the Athletic department, programs and U-M brand will be on the right track. I read where U- Maryland will be cutting 8 sports by next year and that will include track and cross country. Michigan is in the land of Milk and Honey on revenues. I would hate to see football ticket prices go up yet again. The way season ticket holders are litterally bled to death for donations, makes this sour to me. In the end, I am happy for the success of the U-M Athletic Dept but have a skeptical view that they need to limit their greed and not cross that line. Fri, Nov 18, 2011 : 1:27 a.m.
UM has always played at least one lower level team - like Slippery Rock, for instance. No one knew where it was, but they came to play. It's called getting the team's feet wet and giving a small school the game of it's year. Tue, Nov 15, 2011 : 10:11 p.m. This seems like a coded statement telling all of us that Football ticket prices are going up again. Tue, Nov 15, 2011 : 6:36 p.m.
&quot;The department this year funneled $17 million to student athletes.&quot; Hmmm, that's just over 15% of the athletic department's $110 million total budget. Meanwhile the NBA lockout continues because owners don't want to pay the players more than 50% of revenues. Sounds like someone is being exploited in NCAA-land.. Oh, that's right. They're STUDENT-athletes. Fri, Nov 18, 2011 : 1:24 a.m. There is nothing new about the student-athletes system. It wasn't invented by Brandon or even by U of M. It is what it is. Live with it. Tue, Nov 15, 2011 : 6:16 p.m.
Tue, Nov 15, 2011 : 8:28 p.m.
Hey, when you got it, you got it. &quot;You have no idea...&quot; Well Dave Brandon is right. I have no idea what it's like to send the Domino's corporate jet to pick up your next coach, probably loaded with some piping hot pizza pies and a variety of Coke (rhymes with Hoke) beverages, all while planning and strategizing the rise and return of Michigan athletic prominence. I have no idea what it felt like to hand Rich Rodriguez a pink slip, to tell him &quot;Thanks, but no thanks.&quot; I have no idea what it's like to run the third-largest athletics program in the nation. And I'd be all right if he wanted to talk about himself in the third-person, just as long as he keeps our coaches happy and our teams filled with top-notch recruits! Tue, Nov 15, 2011 : 8:07 p.m.
Tue, Nov 15, 2011 : 7:45 p.m.
Tue, Nov 15, 2011 : 3:29 p.m.
Tue, Nov 15, 2011 : 3:08 p.m. I dunno. One thing that comes to mind is how seemingly ill timed or perhaps well timed this discussion is given the theory that the big money in college football creates an environment ripe for potential if not actual abuse of your choice. But. We can be as eloquent, philosophical, practical and diligent in our arguments and comments but we all know....Money talks, BS walks. Tue, Nov 15, 2011 : 2:40 p.m.
Tesla, You mean you don't park your corporate jet at Willow Run every Sat? DB, How many do? So much of what has been &quot;invested&quot; in facilities has been done to make certain that the &quot;game day experience&quot; for the privileged is &quot;very separate and unequal&quot; from the rest of us mere fans. We're Number Three!! We're Number Three!! Academically We're Number 18!! Tue, Nov 15, 2011 : 2:20 p.m. I am a small business owner and have cut costs and cut my profit per dollar for the last five years because I refuse to raise prices on good loyal customers at this time in economic history. This while my costs go up. Maybe thats stupid. I don't know. I believe that my customers would understand too and it wouldn't be unexpected or ill received. Then I read that the football players raise their ticket prices to a football game by over 20%? Thats insulting to me as a businessman let alone how insulting it is to me as a consumer. Wed, Nov 16, 2011 : 12:24 a.m.
Tue, Nov 15, 2011 : 2:06 p.m.
&quot;Brandon is running the third largest athletic department in the nation: U-M's budget is $109.8 million.&quot; Not to be competitive...er...okay, to be competitive, what two other schools athletic departments are larger? I'm guessing Ohio State would be one? Wed, Nov 16, 2011 : 12:23 a.m.
OSU and Texas, with Texas being quite a bit ahead of the rest of the pack. Tue, Nov 15, 2011 : 2:33 p.m.
Tue, Nov 15, 2011 : 1:51 p.m. The athletic department is not the only department that can support it self. The Office of Technology Transfer is finally getting their act together after losing out on Billions (YES, BILLIONS) of dollars in start up companies that came out of inventions,patents, etc from U of M students and faculty. Maybe David Brandon should run the Office of Technology Transfer also! I am sure if someone investigated the story, the U of M Office of Technology Transfer would look like they were Michigan's football team the last 3 years. Tue, Nov 15, 2011 : 12:48 p.m.
Let's hope the Athletic Department can keep supporting itself. Don't forget, the money for those scholarships goes to the UM general accounts. Go Blue!! Tue, Nov 15, 2011 : 12:54 p.m.
Elaine. Thanks for commenting. It's important to note that the athletic department funds all $17M in athletic scholarships itself. Tue, Nov 15, 2011 : 12:19 p.m.
&quot;We will continue to invest substantial billions of dollars.. to feed our athletic department and keep it successful.&quot;-DB. How many more 'billions of dollars' of upgrades to facilities does the athletic dept need? Thu, Nov 17, 2011 : 12:46 a.m.
Who cares, as long as they earn the money to support the upgrades and taxpayers are not asked to contribute. Tue, Nov 15, 2011 : 12:09 p.m.
Tue, Nov 15, 2011 : 11:57 a.m.
Its worth noting that the athletic department competing successfully at the national level is extremely important to .....the athletic department. But a very expensive competitive athletic department is in no way necessary to a successful academic institution. Or I mean to say the University of Michigan athletics and its culture are bound together with the University of Michigan as a whole and what it represents. Tue, Nov 15, 2011 : 6:45 p.m.
Tue, Nov 15, 2011 : 3:43 p.m.
Alright, since Craig was too kind to list them, let me list some top public institutions that have mediocre-to-bad football and basketball teams (or no D1A football at all): - University of Virginia (#25 on US News) - Cal-Berkeley (#21 on US News) - College of William &amp; Mary (#33 on US News) - UC San Diego (#37 on US News) - Illinois (#45 on US News) I could also list UCLA (#25), which hasn't had a good football program for over a decade, and its basketball team hasn't been very good for 3 years Finally, over the last 3 years, Michigan hasn't been very good at football, and only a late season surge last year put Michigan to being pretty good in basketball for the first time in a decade. Has that hurt applications one bit? No - applications are at a record high, whether it is Rich Rodriguez, Brady Hoke or Vince Lombardi as coach. It's great to have a good athletic department in the &quot;revenue&quot; sports, but it is not remotely necessary to have one in order to have a successful academic institution. * Michigan is #28 in US News. And let me stipulate US News is not remotely the be-all, end-all of college evaluations. I just use them here for ease of quick comparison. Tue, Nov 15, 2011 : 3:18 p.m.
Craig - I respect that there are successful universities without &quot;meaningful&quot; athletic programs. However, I think that almost all of those are private institutions. I'm not asking for all inclusive list, but I'll bet that if you do list the universities that you're considering... almost all of them will be private. Tue, Nov 15, 2011 : 3:03 p.m. I don't mind folks disagreeing with what I say. I only hope they avoid creating a straw-man argument by disagreeing to something I didn't say. I didn't say a high brow athletic program is a negative to a high brow academic institution, nor did i say it can't be a plus. I merely said its not a necessity. I could make my case with a list of dozens and dozens of highly respected academic schools who's athletic programs are well below average. But you guys know I can so there's no point. Tue, Nov 15, 2011 : 2:39 p.m.
Did you read the article? If you think this is only important to the athletic department, go tell that to every business owner in this town. And why the negativity? Michigan's athletic department doesn't cost you bupkis. Tue, Nov 15, 2011 : 2:32 p.m.
Tue, Nov 15, 2011 : 1:04 p.m. I somewhat disagree - I think that football program of ours attracts a huge numbers students here who may have been identifying with the Wolverines since they were little kids. And, of course, the quality of education through the incredible amount of research that is conducted at the UM. Two of my kids attended Michigan as undergrads and, honestly, I wasn't expecting much - but I was pleasantly surprised to find out they actually DO get a great education at the UM (go figure.. and go blue). Tue, Nov 15, 2011 : 12:37 p.m. When you look at a list of the top academic institutions in the United States there is no shortage of schools who's athletic programs are practically an afterthought. Tue, Nov 15, 2011 : 12:26 p.m. Disagree completely. The biggest aspect of a school's brand, and its ability to &quot;recruit&quot; top academic talent, is the visibility it gets through its athletic programs. Tue, Nov 15, 2011 : 11:58 a.m.